Gingko dustcovers are truly of Rolls Royce quality. 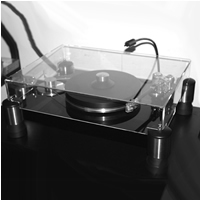 This model is specifically designed to fit the plinth of the VPI TNT. Note: This style cover is not suitable for the 12" VPI tonearms due to clearance issues. Dimensions (W, D, H): 22 5/8" x 16 1/2" x 4"